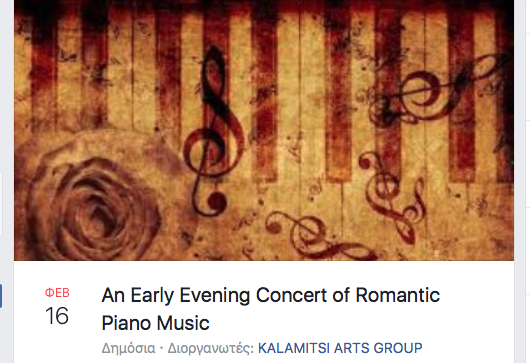 The KALAMITSI ART GROUP invites you to an early evening romantic piano evening. With Ian Brothwood and Phil Harrison.The programme will include classical, contemporary and original pieces. “Join us at this charming cafe for a romantic evening of good music, food, wine and company”. After the concert you can stay for a delicious three course dinner (vegetarian option available). Reservations are required for both the concert and the dinner. To reserve your table please email francesca@amygdali.com and let her know if you also wish to stay for the dinner and if you require the vegetarian option.